My daughter loves music; in particular, she loves to sing. She sings songs in the car, she sings songs before going to bed, she would sing songs on a boat, she would sing songs with a goat, she would sing them here and there, she would sing songs anywhere. 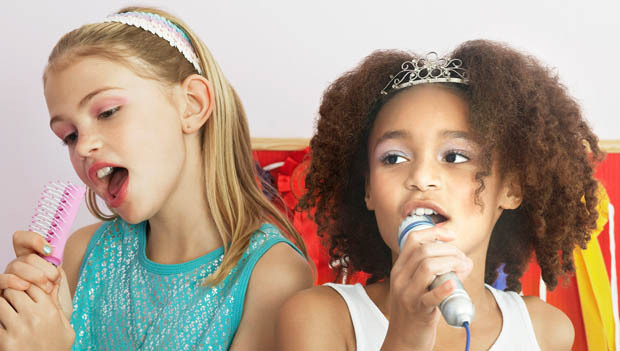 At eight years old, however, it has been surprisingly difficult to find a way for her to take this love beyond singing around the house—the choir at her school isn't open to second graders, and other community choruses are either too far away or too expensive. Many of them also require an audition, which is way beyond what my shy little girl is interested in. I don't think private voice lessons would work either because she loves the fun and freedom of singing, and I'm worried critiquing her technique right now would rob her of that. So how do I nurture her love of singing? When it comes to their musical child, how does any parent walk the line between playing for the fun of it and developing a real skill? Like in sports, there are skills and techniques involved in music that anyone who wants to be serious about it has to learn. The problem, at least for me, is figuring out when (or if) a child wants to "be serious" about something they currently just have fun doing. When I was a child, my mother made me take violin lessons for years despite my desire to quit. She did this because she wanted me to develop interests that would take me outside of our Brooklyn home. She also believed that learning to stick with something even though it is hard, or not a lot of fun, is an important skill for any child to learn. I understand and agree with that viewpoint. However, I don't think that these are lessons children need to learn via the piano or glee club. When it comes to hobbies and extracurricular activities, I am of the belief that parents must follow their children's leads. One of the boys in my daughter's class is a fantastic soccer player—he plays in a league, takes lessons and can't get enough of it. He clearly, even at his young age, has a passion for the sport and the competitive drive to excel at it. But not many eight-year-olds are built that way; they still want to play like children, and the minute the fun is gone, so is their interest. For now, that is how my daughter feels about singing. So despite the fact that she wants to do more of it, she's not ready for the options available to her. Music is about passion. It's up to us, as parents with musical children, to nurture that passion in age-appropriate ways and, more importantly, ways that are geared towards our individual child. Some kids want to be the next Beethoven by the age of five—others love the noises they can make with the keys and want to explore the possibilities of those sounds on their own. Even though we might wish for a flute player, our child bangs the table with their silverware and gazes longingly at drum sets. But if we follow their leads, perhaps as those children get older, they'll decide they want to go beyond having fun and become proficient with their instrument. Or maybe they'll just make a lot of noise in the garage for a couple of years. Either way, the child gets to explore an interest at their pace, and music becomes a part of their world in one way or another. As for me, I have a concert to attend. My daughter is going to perform a series of songs she wrote herself. It's in my living room at 5:00. Meredith Bland is a freelance writer whose work has appeared at Brain, Mother; Narratively; The Rumpus; Time.com; Scary Mommy, and others. You can follow her on Twitter or Facebook.